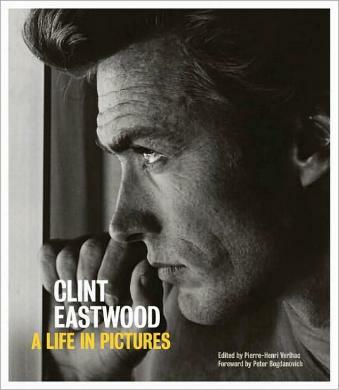 I love this illustrative book on movie hero Clint Eastwood. I've known Mr. Eastwood's work since Rawhide (I watched him in the '60s) and have enjoyed his work ever since. This book covers his breakthrough from Westerns (wasn't he just gorgeous?) to Dirty Harry, and then runs with his string of hit movies he either starred in or directed. Not just a pretty face, Mr. Eastwood is an Oscar-winning director who is known for his ability to bring films in quickly and for being cost-effective. I remember being petrified while watching his debut-as-a-director movie, Play Misty for Me, and have never forgotten the impact it made on me - forever in my mind, when I think of the Monterey/Carmel area, I see the rocks and trees outside the house. Not only is this man a man of film and direction, he's also a musician and has composed for movies as well. Some of my favorite (and meaningful) photos in this book inlude page 25 (Rowdy Yates), page 169 (Mystic River), and page 70 (Dirty Harry). There are many pictures from his movies, too: Paint Your Wagon, Two Mules for Sister Sara; Firefox; Pale Rider; Bridges of Madison County; Million Dollar Baby, and a million others. But, why no picture from Kelly's Heroes? Conclusion - Definitely a necessary addition to any serious Clint Eastwood fan's memorabilia.